← The Chinese have a lot to learn from us and we from them – including ‘Yin Yang’? The World news reports of a growing crisis in Venezuela, but not many of us actually know or understand what is going-on there, do we? No, well not within the UK certainly, but those people elsewhere, like say America, may be closer to the historic situation, perhaps? What the news tells us is that Venezuela’s dictatorial President Nicolás Maduro is facing both country widespread public demonstrations by street marchers demanding the end of his vice-like vicious grip on power, and international pressure to go, and that included demands from Britain, France, Spain and Germany, that Maduro held a fresh presidential election [The parliament is already controlled by the opposition – led since the start of the year by one Juan Guaidó]. [First elected in 2013, the second term of incumbent Nicolás Maduro’s presidency of took place just in January, but his re-election last July has been declared ‘invalid’ by various figures, organizations, and countries. That was because the process lacked legitimacy, there was a ban on the most popular rivals, there was a liberal use of state resources in Maduro’s campaign, the main opposition boycotted it, more than half of the electorate refused to vote, plus evidence of intimidation & vote buying, and other irregularities), whence Juan Guaidó has been elevated to Interim President in accordance with the Venezuelan constitution. 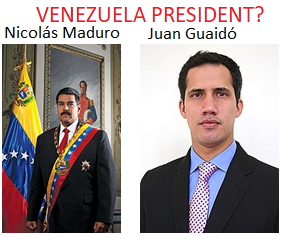 United States, Canada, UK, Spain, France, Sweden, Denmark, Austria, Brazil, Argentina, Colombia, Ecuador, Guatemala, Israel, Latvia, Netherlands, Lithuania, Portugal, Finland, Poland, Germany have all now recognised Guaidó as Interim President]. Now, this is not a crisis that has come out-of-the-blue, is it? Not at all, as it has been brewing for countless years, but things have finally reached critical-mass because the Venezuela government is completely isolated, the moribund economy has ruinously crashed, the community largely is poverty-stricken, there is no food, the health system has buckled and there are no medicines, and the people are aggressively demanding a return to democracy and freedom – well the ones still there are that is, as it seems that some three million of them have already fled the country mainly to U.S. & Spain (if they have means) or Chile & Brazil (if they have less means) with half of them in the past 4 years, eh? While it would seem that massive population protests so far have reportedly been relatively peaceful, nevertheless the risk is that these evolve into a bloodbath, as there are thuggish, armed, revolutionary pro- Maduro government groups (who somehow are the ones to have food in their bellies) who are prepared to fight to the end for the President, no less? Historically, these ‘colectivos’ have had power, have obtained funnelled money and arms from the state, became political enforcers (often lethally), so even challenge the police for control, and help deal with streets protesters – the population rightly have learned to fear these men. What happens now though in Venezuela lies primarily in the hands of the president’s specially selected, patronage benefiting, corrupt, military, which has in the past played a key role in supporting the regime and has been the means of Maduro enforcing absolute control – which shockingly has included his rejection of an international humanitarian aid corridor through Brazil and Colombia to deliver desperately needed medicine and food. However, to understand any of this you have to turn the clock back twenty years to when Venezuela, due to its oil production and its massive reserves of oil, was an affluent country and the richest economy in South America, with all of its mostly urban and educated population having access to clean drinking water, sanitation facilities and electricity, don’t you? His revolution with its expropriations, foreign exchange, price, labour and profit controls, simply destroyed the normal market mechanism that keep a country’s economy in check. Moreover, the country has borrowed massively at high cost so has unacceptably large foreign public debt. Consequently, Venezuela has lost access to international capital markets, creditors are threatening to lay claim to its assets abroad, and others demand some £7 billion in overdue bond payments. When Maduro took power after Chavez died in 2013, he inherited an economy that was in a shamble, but he continued with his mentor’s policy and his answer was to parcel-out patronage, while the criminality in the military, took control of lucrative drug and food trades, as well as illegal gold mining. Unbelievably perhaps, instead of trying to reverse his country’s unprecedented economic collapse, Maduro with a former bus driver’s financial skills no less, embarked on a financial strategy of a frenzy printing of base money to cover large budget deficits, so Inflation was driven upwards at an astounding rate, basic goods became unaffordable, businesses collapsed so more than half of them are gone now, imports dropped, and food became unavailable. This situation resulted in what constitutes a mafia state, and created a violent black-market environment, with the vicious colectivos increasing in control, who together with armed police and military units turned the streets into blood-baths. Oh yes, in support of the population, the US imposed financial sanctions on Venezuela two years ago and prohibited US citizens from doing business there when Maduro suspended constitutional rights and instituted changes to the constitution to enhance his dictatorship powers – that certainly hasn’t helped the Venezuelan economy, has it? Nevertheless, the country is facing even more sanctions if Maduro doesn’t stack and give way to Guaidó, doesn’t it? If Maduro goes quickly and with Chavismo ditched, Venezuela can begin a trek along the difficult road to recovery and to the ending of existing sactions, under a new regime. 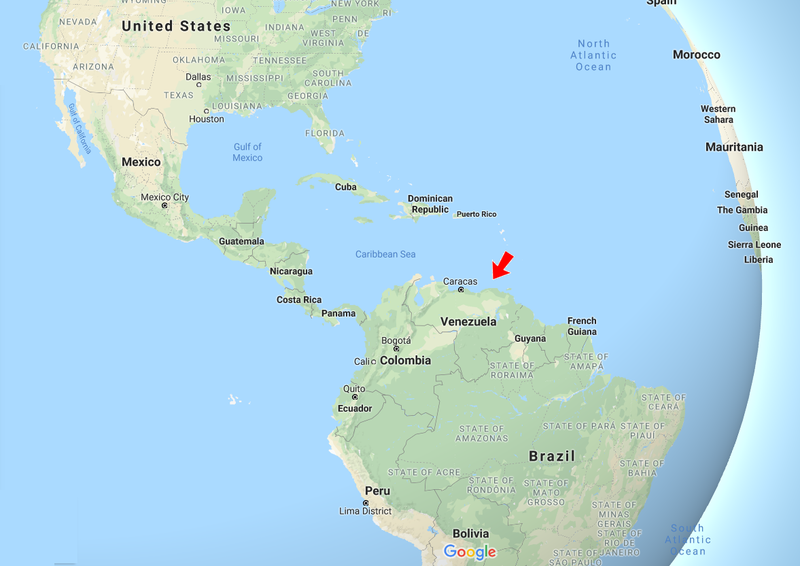 The immediate need is to dramatically increase oil production, as oil is at the centre of the Venezuelan economy and accounts for 95 percent of that country’s export revenues – this will not happen unless the new President brings back the international oil giants to repair and expand its fields, as PDVSA itself is simply not up to the job, is it? Even more importantly he will have to face-up to the problem of more than £70billion in outstanding debt, the bulk in default. He needs to find a solution to halt the immediately impending fight over this crippling Venezuela debt and work with the World Bank and IMF to get the domestic economy back on its feet. That could be partly achieved by America declaring Venezuelan assets temporarily immune from attachment by U.S. courts, just as Obama did previously with Iraq for 3 years by using a national security executive order – Trump has said that he will support Guaidó in Venezuela, but will he do it, with this one huge effective step, eh? This entry was posted in America, business, community, economy, Elections, financial, government, industry, Other Countries, Politics, USA and tagged ‘John McDonnell’, Chavismo, Chevron, colectivos, ConocoPhillips, criminality, dictator, economy, ExxonMobil, Hugo Chávez, humanitarian aid, Hyperinflation, Interim President, international capital markets, Jeremy Corbyn, Juan Guaidó, Leninist, Maoist, Marxist, Momentum, Nicolás Maduro, oil prices, PDVSA, population protests, President, printing base money, production facilities, Stalinist, Total, Trotskyist, Venezuela, Venezuela debt. Bookmark the permalink.